Since the original’s release back in 2002, Final Fantasy X has caused quite the rift among Final Fantasy fans. From X being the first fully voiced game in the franchise to having a main character that comes off as both likable and dislikeable, there were many areas up for debate between fans. 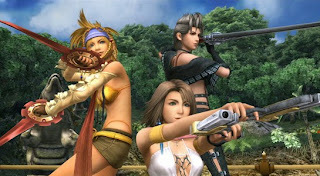 X was also the first Final Fantasy to have a direct sequel, with Final Fantasy X-2 being a more criticised game than its predecessor. So here we are, 12 years later as Square Enix have finally decided to release the international versions of both Final Fantasy X and X-2 on PlayStation 3 and the PlayStation Vita. This review will be focusing on the Vita versions, as we have a look at how the two titles have aged and translated to Sony’s handheld. If you are unfamiliar with the plot of Final Fantasy X, the basis of the story centres around Tidus, a blitzball player looking to return to home and Yuna, a summoner undertaking a dangerous pilgrimage. The two are brought together by Sin, a gigantic monster that wreaks havoc in the world of Spira as summoners look to destroy it at the end of their pilgrimage. 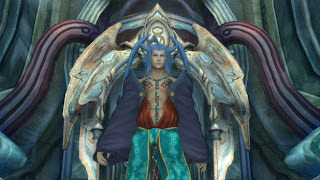 A consistent presence throughout the game are the issues between the followers of Yevon and the Al Bhed, which helps to make the world of Spira more realistic (and controversial) as it comes off as two religions disagreeing with one another. Sin remains in the background throughout the majority of X’s plot, making appearances every now and then which makes the villainous Maestar Seymour the more apparent antagonist, as he looks to become the next Sin by any means necessary. You’ll find yourself more interested in knocking sense into him instead of killing Sin, though his intentions are pretty unique in comparison to most FF villains. As for the party of characters that you control, the group still remains a memorable one especially with Auron’s cool demeanour making him the standout. 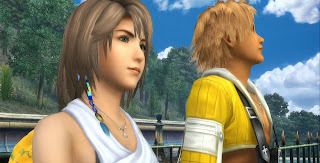 However what stood out to me this time around was the natural vibe I got from the relationship between Tidus and Yuna. During their time together, you see awkward moments (such as the infamous laughing scene) and signs of their affection growing for each other. It managed to make me care more for their relationship then I ever had before, though Tidus made it tricky for me to do so. While Tidus isn’t a very likable main character, he is made much worse by a narrative that I genuinely don’t remember being as bad as it was this time around. While the voice acting can be absolutely shocking at times (more on that later), the dialogue doesn’t do it any favours as it comes off sounding comical in situations when it really shouldn’t, especially a lot of what Tidus says. Tidus is unlucky, as we are subjected to hearing him speak more so then any other character, so it’s his lines that (unfortunately) stay with us the longest. The plot for X-2 is much more on the lighter side then X, as it follows Yuna, Rikku and newcomer Paine collectively known as the Gullwings, as they hunt for spheres in hope of finding Tidus. While the game again features a dispute between two factions (this time New Yevon and the Youth League), the tone as a whole is a lot less serious. Now despite the shift in tone, the plot actually remains relatively enjoyable for the most part however as a result, the events of the game don’t feel like that big of a deal especially compared to the rest of the series. This isn’t helped by having a main antagonist such as Shuyin that’s incredibly uninteresting and forgettable. Bridging the gap between X and X-2 is Final Fantasy X: Eternal Calm; a 15 minute cutscene that focuses on Yuna and does a decent enough job showing why she decided to become a sphere hunter ahead of X-2. The gameplay in Final Fantasy X remains the same, with the smooth turn-based style still a lot of fun to use. It’s made even better by being able to switch characters in and out of your party mid-battle, which is something I’ve always loved as it allows you to utilise all characters on a consistent basis. The sphere grid system is still a delight to use, as it allows you to customize each characters’ skills however you want, which still surprises me as to how excellent it works over a standard levelling system. X-2 ditches the sphere grid system; instead introducing dress spheres in its place which allows the three characters to change the skills they possess by changing dresses (similar to the character/job classes in some of the older FF titles). It’s a mechanic that Square Enix brought back for Final Fantasy XIII: Lighting Returns earlier this year and it remains a solid and interesting way to use your characters (even if some of the outfits look ridiculous). Another change made in Final Fantasy X-2 was the battle system, which moved away from the traditional turn-based style in favour of a fast-paced ATB (active time battle) system. The change was loved equally as much as it was disliked, with me falling into the latter category. I never found myself enjoying the battle system, with it becoming borderline ridiculous as to how many times you would have to revive a character in battle because of them getting killed literally seconds after being healed. Despite my dislike of the battle system, I can fully understand why players enjoy the fast paced battles over the slower turn based system. Final Fantasy X-2: Last Mission is an extra mission that takes places 3 months after the end of FFX2. The mission occurs in just one new area known as Iutycyr Tower, as you control just one character that ascends the tower. The gameplay completely changes here, becoming grid based as you move about, striking enemies, levelling up and finding new jobs (dress spheres), and boy does it stand out as the most mundane part of the game. It’s incredibly slow compared to the ATB system (and hell even the turn based system) and is such a boring way to close the Final Fantasy X story. I genuinely wouldn’t be surprised if players skipped Last Mission after seeing how it plays, and I wouldn’t blame them either. The PlayStation Vita’s touch screen and analog sticks add both a bit of good and bad to the final game, with a swipe of the touch screen being used when not in combat to heal your party (via items or magic; entirely up to the player), which is a nice touch that enables you to heal while on the move. Unfortunately the Vita analog sticks aren’t suitable for some of FFX’s uses; with it being very fidgety trying to select the correct enemy to attack (I attacked my own party more times than I would like to admit). Lastly the choice to not change how you perform Lulu’s overdrive was a seriously bad one, as you still have to rotate the right analog stick to build up the power of her overdrive yet the Vita’s analog sticks aren’t as mobile as the PS2/PS3’s, so it’s highly unlikely that you will ever be able to use her overdrive to its full potential. Tidus, Yuna and co look better than ever on the Vita screen. There were moments very early on where I was shocked as to just how detailed the characters actually looked. Every character looks great and while the facial animations aren’t too great on X, they do look particular good on the main characters in X-2. If I had to nit-pick one thing about the visuals, it would be that Tidus’ face looks oddly fat at times especially in comparison to how he looks during FMV scenes (that also look fantastic on the Vita screen). The music for both games is still as magical as ever. Whether you are loading the game up and hearing the iconic piano introduction, traveling through the mystical Macalania Forest or encountering the enigmatic Seymour, every song in the games’ soundtrack is superb and a genuine treat to listen to. It really is impossible to find faults when it comes to Square Enix and the music of Final Fantasy; they manage to knock it out of the park every single time. The voice acting in FFX is just…strange; strange because I don’t remember it sounding so terrible. As I already mentioned, the narrative is pretty bad throughout FFX (though slightly improved in X-2) with characters speaking in a manner that doesn’t sound natural and as a result just comes off comical. Tidus is the worst offender, as he comes off being so annoying whenever he opens his mouth though he does improve somewhat as the game goes on (funny enough when narrating, he doesn’t sound anywhere as bad). I won’t pick on Tidus as many of the characters sound surprisingly bad, and as a result don’t show as much character as they should do. I think the fact that X was the first fully voiced Final Fantasy could be one of the reasons as to why the voice acting was as bad as it was, as X-2 did a better job than X at showing off each character’s personalities. There’s no denying that Final Fantasy X was a landmark in the franchise. Some see it as the start of the decline in the Final Fantasy series; others consider it one of the best Final Fantasy titles. It remains highly debatable, but that doesn’t stop it from being a game worth playing especially if you are a JRPG fan looking for a title to sink dozens of hours into on your PlayStation Vita. Make sure to check us out on the social networks and let you know your thoughts!